Customers can save money with Production Basics’ new Suspended Drawer Units. These 18- & 20-gauge steel units feature various configurations of 3”, 6”, and 12” full-extension drawers in one chassis meaning they use fewer materials and weigh less, which also means less expensive shipping costs. 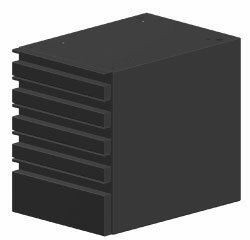 Each 19"D x 14"W x 18"H drawer unit chassis combination features 18” of drawer space and is available in a standard black color. Suspended Drawer Units are available for use with C-Leg and Easy-Lift Dual Leg Workstations, RTW Tables, and Easy-Lift 4-post workbenches. For more information, or to purchase these Production Basics Suspended Drawer Units, please call (800-966-6020) or email us and one of our expert associates will help you find the perfect unit to match your workstation configuration. You can also select from an extensive selection of Production Basics products from QSource.com’s Production Basics section.